I am delighted to see this article about my father appearing on the web site of the New York Correction History Society. Babe Ruth swinging his homerun bat. 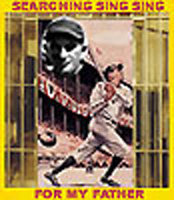 A Sing Sing inmate baseball team photo player's face resembling that of the author's father. Thanks to the society's creative and careful effort, the story of my dad’s incarceration in Sing Sing Prison is now more comprehensive and replete with many splendid photographs not included in the published article. “Searching Sing Sing for My Father” as it appears here is as thorough and satisfying to me as I could have wished when I first thought of writing it. The long and often frustrating search to learn about my father’s life in Sing Sing was well worth the effort. I am gratified by not only what I discovered about my Dad, but what I also learned about my parental family and myself. For me, the search opened doors to memory compartments I thought were sealed shut and made me realize that I still could enjoy historical research after years of inactivity. The research itself was exceedingly pleasurable, particularly because it involved the examination of new and unfamiliar materials. For this history, I found myself working in modern American rather than old Spanish archives and studying twentieth-century rather than eighteenth-century documents. It was an enjoyable experience made more exciting by occasional fantasies that I was a private detective searching for information about a man who had disappeared. Most important of all, the lengthy search for my Dad’s life in Sing Sing brought me back to my earlier life as a child and young man when my parents were middle-aged and my father was my only confidant, friend and masculine ideal. My eyes water as I write these words and I must say that my father continued to hold those roles for me all my life. Even after the crimes he committed, the prison sentence in Sing Sing, all the misery his gambling gave my mother, the money he took from his sons and the fear we all felt when he lost our food and rent money, he remains in my heart a man I love and admire. Robert L. Gold, Ph. D.
NYCHS presents original text of Robert L. Gold's Searching Sing Sing for My Father by permission of its author. A somewhat shorter version appeared in the Spring 2002 issue of The Westchester Historian. NYCHS appreciates receiving the permission of both the author and the publication to make this presentation. All copyrights remain reserved and retained. 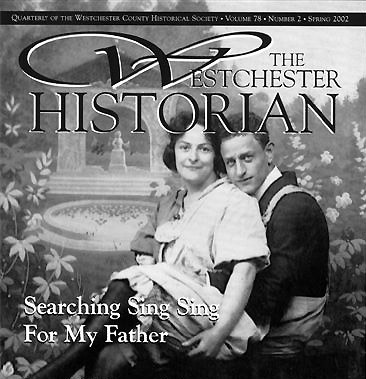 For information about that Westchester County Historical Society publication, visit The Westchester Historian web page.